The first carrier rocket to be developed in Russia after the breakup of the Soviet Union has been successfully test-launched. What prospects does the new rocket hold for the Russian space industry and does it have a commercial future? Angara-1.2PP, the first environmentally friendly launch vehicle to be designed in Russia after the breakup of the Soviet Union, was successfully launched from the Plesetsk Cosmodrome in the Arkhangelsk Region on July 9, flying a distance of 3,550 miles to the Kura range on the Kamchatka Peninsula. Stage 1 of the rocket was released into the target area in the Barents Sea four minutes after lift-off. Some 21 minutes after the lift-off, Stage 2 and the payload simulator reached the planned target area. The first launch of the light Angara was originally scheduled for June 25 but was postponed due to the need to carry out additional checks. However, even on the new date, June 27, the launch was automatically aborted just 19 seconds before the scheduled lift-off. President Vladimir Putin, who was watching the proceedings via a video link, instructed the relevant parties to find out what went wrong, and the launch was postponed. It turned out that the Angara had failed to blast off because of a leak in a valve not related to the engine. The Russian Federal Space Agency (Roskosmos) decided to fix the fault right on the launch pad. The rocket was successfully launched at 16:02 Moscow time on July 9. The Angara rocket family is a new generaton of modular launch vehicles. It includes light to heavy-class varieties, with payloads ranging from 3.8 to 35 tons. All of them can be launched from the same launch pad. Each universal module is equipped with a powerful RD-191 liquid-propelled rocket engine. Different configurations of the rocket vary by the number of universal rocket pods that Stage 1 consists of. The Angara that was test-launched on July 9 was an interim variety, aimed to test both, Stage 1 and Stage 2. Although the rocket launched was a light-class one, its second stage was taken from a heavy variety. In future, heavy varieties of the Angara will be fitted with a third stage, running on hydrogen, which will make it possible to launch much heavier payloads from Plesetsk. The first manned voyage in a heavy Angara rocket is set for 2018 from Russia's new cosmodrome at Vostochnyy in the Amur Region. The appearance of this new class of rockets means Russia has secured for itself an independent and reliable access to space. From now on, it will be able to launch all types of satellites to low earth and high geostationary orbits without having to agree them with Kazakhstan, where the Baikonur Cosmodrome is located. Furthermore, the production of the Angara rocket does not depend on any outside contractors since, for reasons of strategic security, the rocket was designed and manufactured wholly by Russian companies located on Russian soil. Another important thing is that with Angara rockets, space launches will become more environmentally friendly. The previous generation of rockets, the Protons, run on heptyl, which is very harmful for the environment, whereas the Angara uses kerosene and oxygen for fuel, which is considered to be far less toxic. Andrei Ionin, a corresponding member of the Tsiolkovsky Russian Academy of Cosmonautics, believes that alongside making the Angara family of rockets, which will not be used for commercial launches, Russia should start developing a cheaper heavy rocket. "The Angara does not have a commercial future at the Plesetsk Cosmodrome; one should be clear about that. Its task is to take to space federal satellites built with budget funds," he says. That is why Russia, Ionin continues, should start developing heavy but inexpensive launch vehicles, similar to what the private U.S. company SpaceX is doing. SpaceX already manufactures rockets costing about $70 million. "In order not to lose the commercial space market altogether, Russia should continue using Protons costing some $100 million per launch and start developing a rocket that would cost about $50 million per launch, so as not to leave this segment of the market to SpaceX," Ionin warns. The first successful launch of the Angara is of great importance for the Russian Defense Ministry too, points out Igor Marinin, another member of the Tsiolkovsky Russian Academy of Cosmonautics. "The Angara will make it possible to take payloads to geostationary orbit from the Plesetsk Cosmodrome, which is very important not only for commercial launches of communications satellites but for the Defense Ministry too. 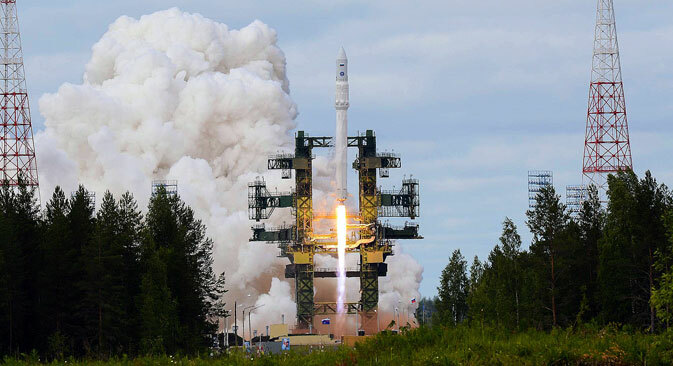 Now that we have a heavy rocket blasting off at the Plesetsk Cosmodrome, we shall no longer be dependent on another state for our military space launches," says Marinin. Based on reports from RIA Novosti, Gazeta.ru, ITAR-TASS.